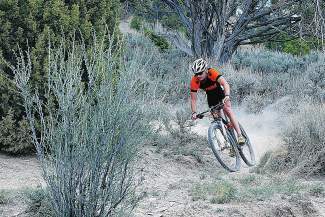 A mountain bike rider kicks up dust while descending single track in the Berry Creek area of Edwards. Trails in that area are popular among bikers, hikers and off-road motorists. On the Trail, brought to you by The Steadman Clinic and the Steadman Philippon Research Institute, features a different Vail Valley trail twice per week. Distance: The main loop is approximately 7 miles. Trailhead (directions): The intersection of Beard Creek Road and Moonridge Drive in Edwards. The Berry Creek trail system on the north side of I-70 has several options for hikers, bikers and off-road motorists. Popular with Singletree residents, but also a destination unto itself, the Berry Creek trails are accessed via Berry Creek Road, which has a trailhead located at Moonridge Drive and Beard Creek Road across from the medical center in Edwards. The trailhead is managed by the Berry Creek Metro District, which is funded through property taxes and meets on the fourth Tuesday of every month at 8:30 a.m. at the Singletree Community Center. The Berry Creek trails see a lot of action from users starting in the spring, as its south-facing slopes are quick to dry out after a long winter. The annual Berry Creek Bash, a mountain biking race held by the Vail Recreation District every summer, brings crowds to the venue to see top-level mountain bikers take on the roughly-7-mile loop. That loop contains approximately 1,500 feet of elevation gain and has a few tough climbs and downhills like the popular “Endo Alley” steep section near the middle. Sagebrush lines much of the landscape in the Berry Creek area, which has been identified as an important sagebrush habitat. The Ski Conservation Fund has taken their Sagebrush Enhancement Project to Berry Creek in recent years in an effort to preserve sagebrush there, as pinyon and junipers have begun to encroach into the area, which abuts residences in the Singletree neighborhood. Many Berry Creek trail users contribute to the Sagebrush Enhancement Project in that area without even realizing it, as the fund is supported through micro-donations from ski lift tickets purchased at Vail and Beaver Creek. Both Vail and Beaver Creek ski areas are visible from the Berry Creek trails, and the popular 4×4 trails “June Creek” and “Red & White” can also be accessed from Berry Creek Road.